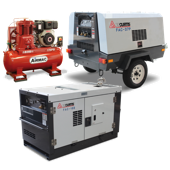 Enerquip supply and service a range of Fusheng-powered piston air compressors designed and built by Airmac specifically for smaller industrial applications, as well as heavy-duty domestic and trade users. 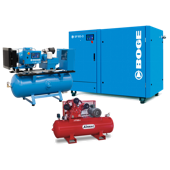 These air compressors are built for reliability with genuine parts, and are compliant with Australian safety standards and regulations, including AS 1210-1997 (pressure vessels). Genuine cast iron Fusheng pump (distributed in Australia for over 30 years). Totally enclosed fan cooled (TEFC) TECO cast iron frame electric motor with IP55 rated enclosure protection and sealed roller bearings. Australian Minimum Energy Performance (MEPS) compliant. Australian standards safety compliant, enclosed steel belt guard. German pressure switch with built-in unloader to minimise start amp draw, including motor overload protection capabilities. 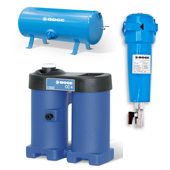 High quality air filters to protect equipment from dusty and dirty environments. Air receiver tank compliant with Australian standards. High-grade copper piping used throughout. 2 years parts & factory labour warranty. The many thousands of Airmac units already in service throughout Australia are definitive proof of their quality and reliability. To view Enerquip’s electric piston air compressor models, use the side menu.